Enjoy the taste of fresh tomatoes all year round with my best canned salsa recipe. With tomatoes, it’s feast or famine. In the winter, they can only be grown indoors, or in places where it doesn’t get cold. 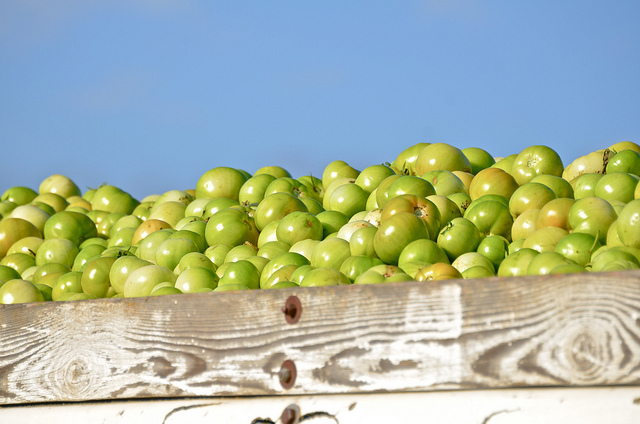 To get them to our northern grocery stores, they are picked green, long before they can ripen on the vine. And since nobody wants a green tomato, the growers use ethylene gas to artificially turn the tomatoes red. Note that I didn’t say ripen. What you end up with is a green tomato that has turned a sickly orange-ish color which tastes terrible. It’s sad, but most of us just forego tomatoes until they come back in season. Fast forward to late summer. Many people (like me) plant vegetable gardens, and the tomatoes all come ripe at once. There is really nothing better than a vine-ripened tomato, but realistically, what can you eat, maybe one or two a day. Meanwhile, your plants are producing many, many more than you can eat fresh. Lots of people can them. My experience has been that canned tomato sauce is a good way to deal with them, but I’ve always gotten through the year with sauce left over. I needed a way to deal with the crush of tomato-ey goodness, that everybody would love. Make salsa! Everybody loves chips and salsa, and it works for a summer picnic, and a January football game. The trouble with salsa is that almost every recipe you can find will result in fresh salsa which tastes great, but won’t keep. 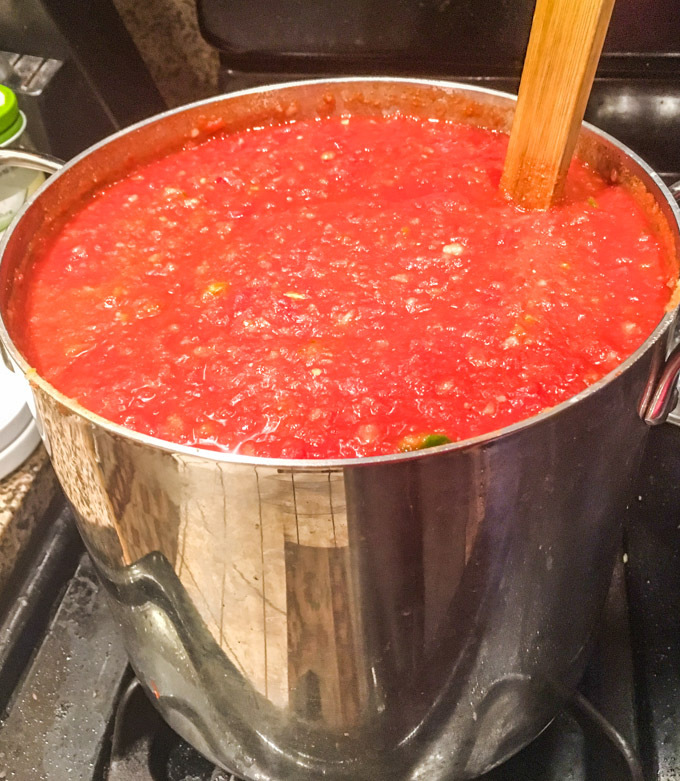 I have a recipe that I really like for making the best CANNED salsa, which will be there the next day, the next month, and the next spring when there’s not a fresh tomato in sight. It’s so good, that the first time I made it, we went through eight pint jars in just a couple of weeks. Now, I make batches to can, and other batches to put in the fridge and eat. The stuff is great with chips, and as a condiment for Mexican and other foods. First thing you need is a lot of tomatoes. Like 8 lbs. I can get these together during the biggest waves of the summer growing season. But what do you do if the crush is over? Well you can go to a local farmer’s market and buy them in bulk. But if your plants are done producing, chances are so are the local farms. Today, I will try using canned crushed tomatoes. I bought a case of six 28-oz cans at Costco. After I’m done, I’ll compare the result with my previous batches using fresh tomatoes. With fresh tomatoes, you need to wash, core, and blanch them in boiling water followed by an ice bath to aid in removing the skins. Afterward, crush them into the biggest pot you have. With only a few stragglers left in my October garden, I will save myself a lot of effort and just use a can opener. Place all of these ingredients into the pot (I use a large stock pot) along with the crushed tomatoes, and mix well. Don’t worry if it’s pretty full as the mixture will cook down. Place the pot on medium heat until it starts to boil. Then turn it down to maintain the boiling. Stir occasionally as the salsa at the bottom of the pot may burn a little. Cook for 3 hours with the lid off. You should see the mixture reduce in volume and become quite thick. Don’t fret if you get a bit of burnt salsa as I think the flavor is enhanced. To Can or Not To Can….. Taste and add chopped chilies if you want the salsa to be hotter. The result is a thick, sweet and spicy salsa that tends to disappear very quickly in my house. Unlike the fresh stuff, it is also perfect for canning. The recipe should yield about 4+ quarts. I chose to can the 4 quart jars, and keep a couple of pint jars in the fridge for easy snacking. Go through the stuff in the fridge, and save the canned stuff for later. The real question is “Is the salsa made from canned tomatoes as good as that made from the fresh ones?” My expert, 13-year old Max, says that the canned stuff is just as good if not better. Along with being a great chip dip, I use it on all my Mexican food like my Chili Rellenoes. 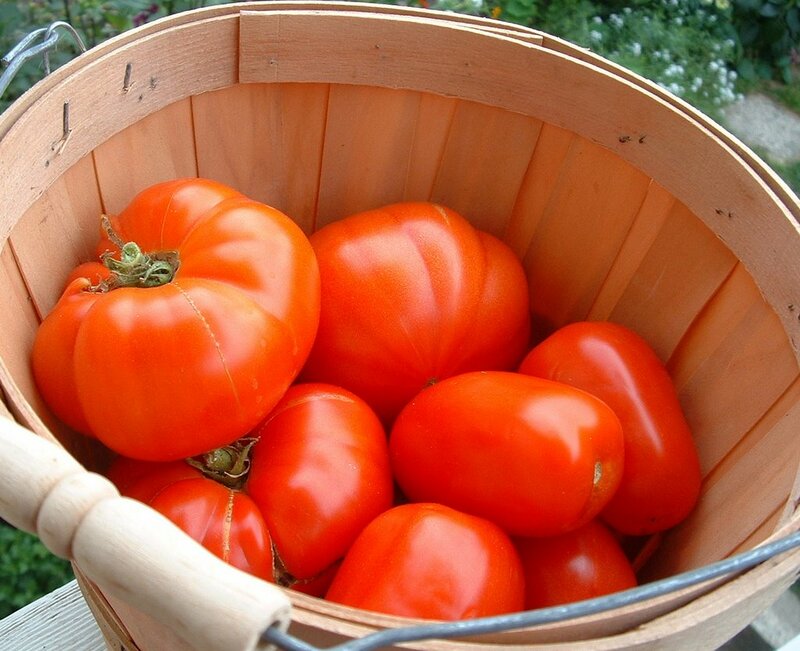 Enjoy the taste of fresh tomatoes all year round with my best canned salsa recipe. Can use fresh tomato or canned tomatoes in this salsa recipe. With fresh tomatoes, you need to wash, core, and blanch them in boiling water followed by an ice bath to aid in removing the skins. Afterward, crush them into the biggest pot you have. Place all of these ingredients into the pot (I use a large stock pot) along with the crushed tomatoes, and mix well. Don't worry if it's pretty full as the mixture will cook down. Place the pot on medium heat until it starts to boil. Then turn it down to maintain the boiling. Stir occasionally as the salsa at the bottom of the pot may burn a little. Cook for 3 hours with the lid off. You should see the mixture reduce in volume and become quite thick. Don't fret if you get a bit of burnt salsa as I think the flavor is enhanced. I have a serious chips and salsa addiction, so this is calling my name. 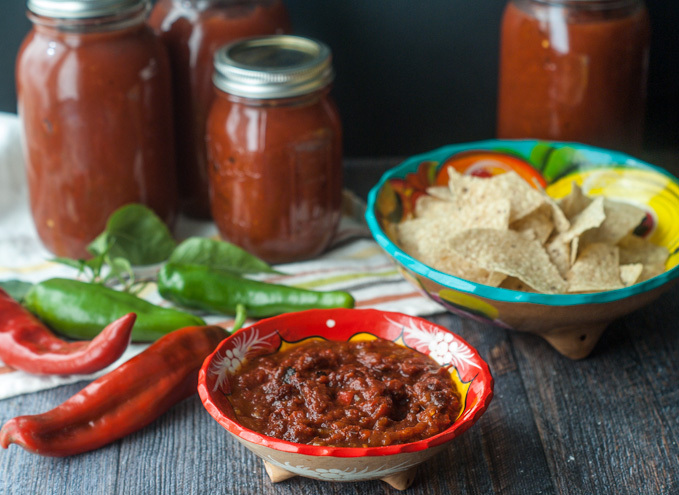 I love that it works with canned tomatoes too…salsa all year round! I LOVE homemade salsa and your recipe looks fantastic! Definitely one to make soon! Thanks. It takes a bit of prep, but it’s worth the time if you make big batches. Your salsa looks amazing! It is just calling out for a big bag of chips to dunk in it! Thanks. I found that using canned tomatoes gave me a more uniform consistency (less chunks). We are having my son’s birthday party tomorrow, and we will go through a couple of quarts. This is making my mouth water, I have been going through a chips and salsa kick lately. I will have to make this soon. You’ll love it. We go through this stuff quickly, especially when we have people over. Even my picky 13 year old would eat this all day long. My sons brought me about 15 pounds of tomatoes this summer – which got frozen. Now, I know what to do with them all! Alicia. I haven’t used frozen tomatoes, but I’m guessing it will be ok. Please let me know if it works out. Love love love salsa! Thanks so much for sharing at #Over the Moon. We look forward to seeing what you’ll share with us next week. Thanks! I’m a huge salsa fan. The jarred stuff you can get in the grocery store just doesn’t do it for me, and you can only make the fresh stuff in season. This is the best of all worlds. When I make it, I just eyeball the number of hot peppers. Every so many batches, I have to put an “H” on the lid with a sharpie so we know that batch is a hot one. My kid, who doesn’t like hot food, eats it anyway. I popped over to see this recipe too. pinned for later. i can’t wait for next years canning season. Thanks Theresa. Maybe the most important thing I learned this year is to use canned tomatoes when you can’t get fresh. Really seems to be no difference in the finished product. We can Salsa every summer from the veggies that we grow in our garden and it is the best ever. I pinned your recipe it looks delicious! Thanks so much for sharing with us at Full Plate Thursday this week. Hope you are having a great week and come back to see us real soon!